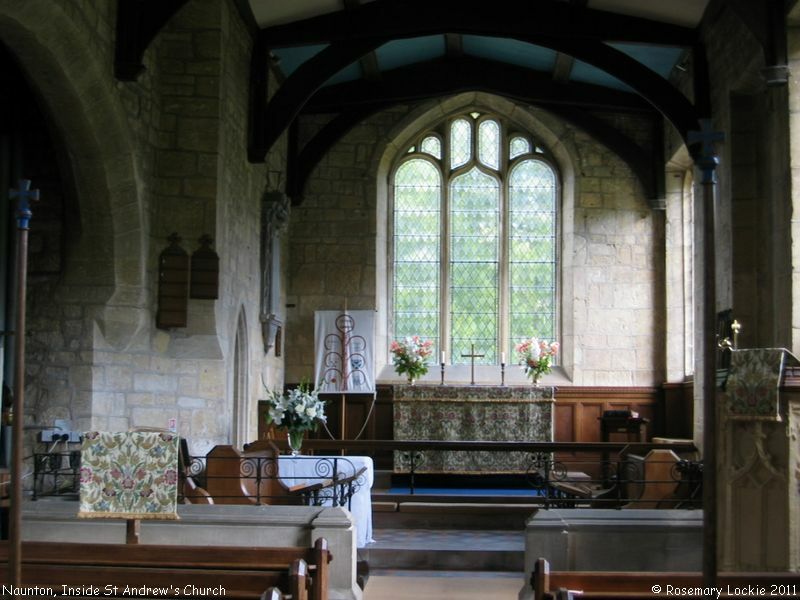 St Andrew's Church has a light and airy interior, with an unusual blue ceiling above the altar. On the day of our visit we saw an exquisitely embroidered altar cloth, with matching hangings for the pulpit and lectern. 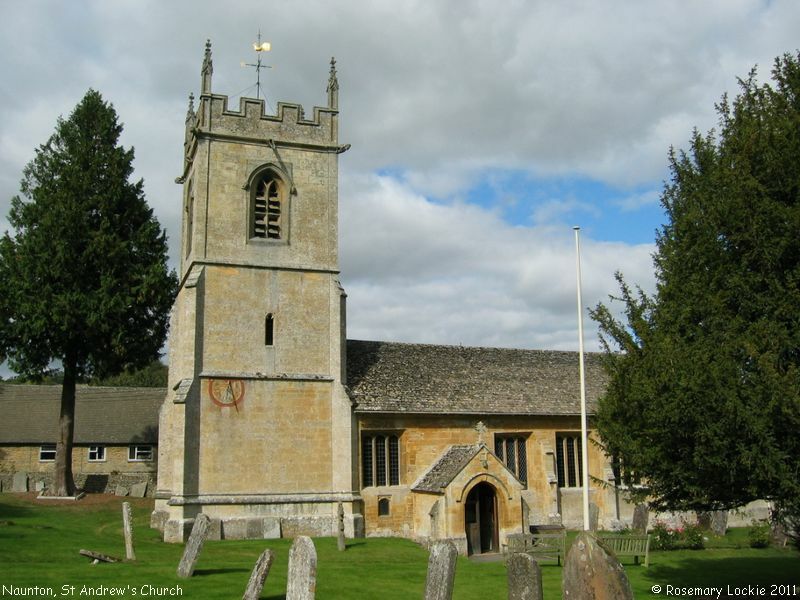 An information leaflet inside the church tells us the earliest evidence of Christian worship in Naunton was found buried under the nave of the present building, in the form of a stone Saxon cross. This is now set into the north side of the west wall of the nave. 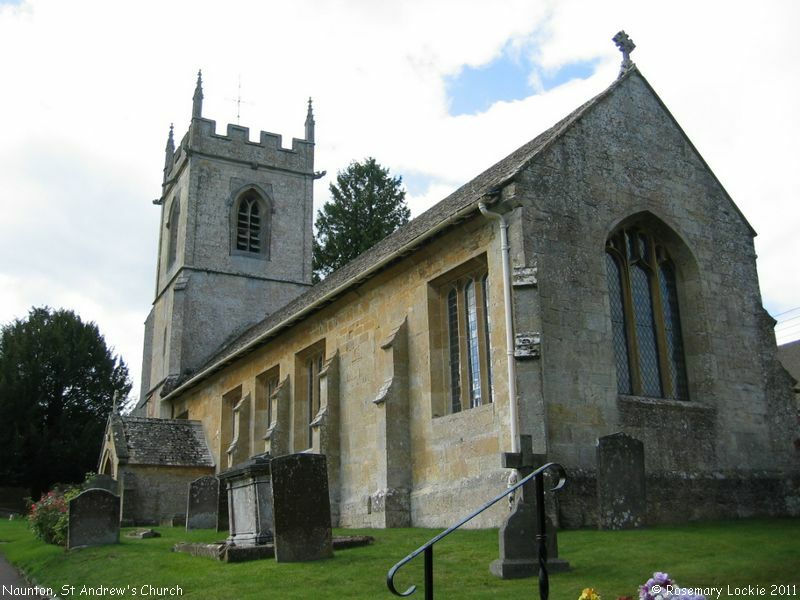 The first known church may have been in existence by the twelfth century, but this was largely rebuilt during the fifteenth and early sixteenth centuries, and now only the foundations and lower walls of a nave, chancel, and tower from the original building remain. Other features from the 12th century in today's church include a corbel head over the east window of the vestry, and markings in the masonry of the exterior south wall of the nave. 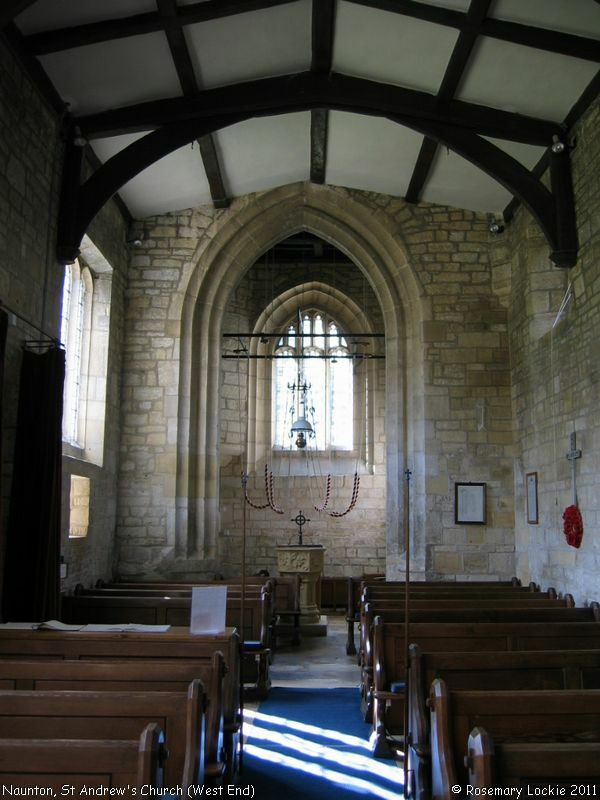 The north aisle, with a Lady Chapel at its east end, dates from the latter part of the 15th to early 16th century. The stone pulpit dates from around 1400 although the plinth is modern. In 1748 two sundials were placed on the tower, the dial on the south face having the inscription: 'Lux umbra Dei' (Light is the Shadow of God). 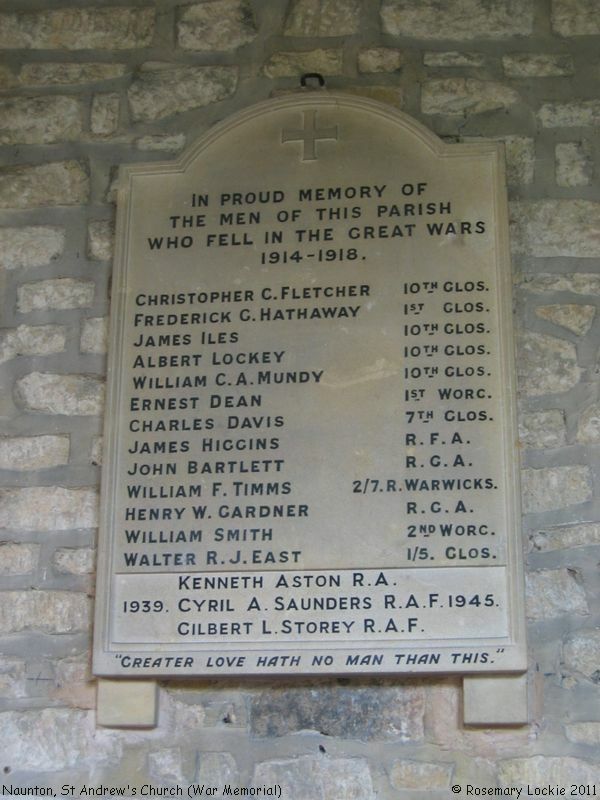 A War Memorial was placed on the north wall of the north aisle in 1919. The names of those who died in the war of 1939-1945 were added at a later date. Christopher C. FLETCHER 10th. Glos. Frederick G. HATHAWAY 1st. Glos. William C.A. MUNDY 10th. Glos. William F. TIMMS 2/7.R. Warwicks. Walter R.J. EAST 1/5. Glos. "Greater Love Hath No Man Than This". St Andrew's Church, Naunton shown on a Google Map. Places of Worship in Naunton shown on a Google Map. Information last updated on 19 Sep 2011 at 15:09. This Report was created 28 Mar 2019 - 20:57:39 GMT from information held in the Gloucestershire section of the Places of Worship Database. This was last updated on 7 Feb 2019 at 07:45.